In New York City, ballrooms dominated Harlem, but one, The Savoy was to become the king of Swing. 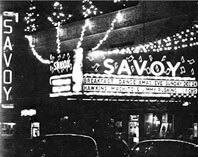 The Savoy was huge, taking up the whole block at 141st Street and Lenox Ave. Lindy flourished there, partly because it was one of the few racially integrated ballrooms where White and Black could dance, be inspired and shared moves like no other place. Jazz was in its heyday, since a night out dancing was cheap, and recorded music was not yet readily assessable. Names such as Cab Calloway, Duke Ellington and Count Basie made music history in the battle of the bands held there. The players would feed off the dancer's improvisation as much as the dancers fed off the music. The atmosphere of the Ballroom must have been electric as the top dancers would meet in "Kats Corner" and take turns to show off and play with the rhythms. Weekly competitions promoted friendly rivalry between dance troupes and dancers were inspired to create new, more exciting moves to wow the crowd and win over the judges. Audiences were amazed to sight the first Aerial move (or airstep) created by Frankie Manning and his partner Freda Washington for these competitions. 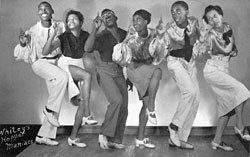 The Spectacular something was a "Whitey's Lindy Hoppers". Herbert White or "Whitey", the head bouncer at the Savoy, was skilled at drawing together the best dancers from the Savoy to join his dance troupe. He arranged performances and competitions all over the country, and got his group into many films, such as "A day at the Races" and "Hellzapoppin". "Lindy Hop" refers to this particular dance done and Swing was the music they would dance too. The term "Swing" is now commonly used to include many styles of dance: Lindy Hop, Jitterbug, Balboa, Shag, East and West coast swing, Boogie Woogie, and has also inspired Jive, Rock and Roll, Ceroc, Le-Roc with regional differences in each dance family. Many may say that Lindy Hop was the granddaddy of them all, but that should not imply that no one was dancing any form of Swing before Lindy swept the country. People were already creating dances to their local bands. The variations in the music and the conditions they were dancing in impacted on the dance that was created in that region. The performances that came out of the Savoy Ballroom however, must have rocked their world when they saw them on stage or at the flicks! They only had one chance to see a move before reinventing it for themselves, so the moves would evolve and become something new, and the dances would blend to accommodate the new fashion. One such blending is the Jitterbug, which is so close to the Lindy hop that one might call it the same dance. The Jitterbug though, referred to a different styling, and may also refer to the way the white kids danced the Lindy Hop - as if they had been drinking an illegal moonshine called "Jitter juice". 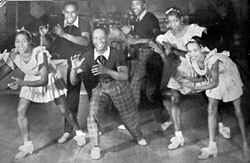 Nowadays, the term Jitterbug can be used to mean different dances in different places, but Lindy Hop still refers to the Savoy Style of dance. Dean Collins inspired what we now know as "Hollywood" and "Smooth" style Lindy. Dean had learnt Lindy in New York in the early 30's before moving to LA and taking the Savoy Style Lindy Hop with him. Once in LA, Dean smoothed out the dance and put his own emphasis on it. This lead him to choreograph and perform in many films including "Lets make Music", "Chool Song" and "Buck privates". Dean also broke the dance into teachable components, Arthur Murray being one of his students. In more recent swing history, Sylvia Sykes and Jonathan Bixby rediscovered Dean Collins, and perfected the art of "smooth style" directly from its master. The swing revival has also prompted Erik and Sylvia Robison to coin the term "Hollywood Style", to refer to the style of dancing seen in movies of the era, including those starring Dean Collins. The original Lindy Hop died off as the music changed to Be-Bop and Rock and Roll. An entertainment tax made live big bands expensive and as recorded music became affordable, dance halls became smaller and more crowded, and the style of dancing had to change to accommodate this. In the mid 1980's some of the original members were rediscovered by new dancers inspired by their film footage Steven Mitchell & Erin Stevens found Frankie Manning. The Rhythm Hot Shots found Al Minns, and The Jiving Lindy Hoppers found Mama Lu Parks. Since then, Frankie Manning has come back on the dance scene, teaching new Swing dancers around the globe. The retro dance returned, along with neo-swing bands and vintage fashion. Lindy hit the movies yet again with "Malcolm X", "Swing Kids", "A League of Their Own", "The Mask" and "Swingers". The TV also favoured the new Lindy dancers, with appearances on Ally McBeal and the GAP advert. The Lindy Hop is arguably bigger now than it was in its heyday. Whitey's Lindy Hoppers never would have thought that their dance would be spread across the world via the internet, videos, workshops and classes. Today knowledge moves fast, but some things stay the same - Swing music still inspires the freedom of improvisation, a romantic style remains in the dance culture and, most importantly, dancers still love dancing with a partner. This article was contributed by Shona Smith who is a UK based Lindy Hopper. Shona originally comes from Wellington, New Zealand where she founded the 'Studio Red' dance studio specializing in Lindy Hop. She moved to the UK in 2002 and now lives in West London. Every attempt has been made to ensure as much historical accuracy as possible of the facts published in this article. If you have any comments concerning the accuracy of any information published here then we would be glad to hear from you. Send any queries in the first instance to the web master.